Your college dorm room won't have a dorm mirror when you first move in. That means when you want to put on your makeup, you're going to be carrying all of those cosmetics to the dorm bathroom or you'll need a dorm mirror in order to do your makeup from the comfort of your college dorm room. Whether you're walking back and forth to the dorm bathroom or staying in your college dorm room, you will need somewhere to store your cosmetics and make transport easier. 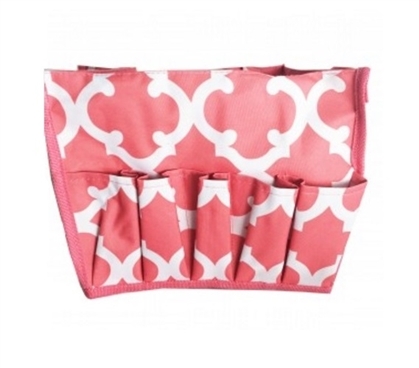 For a more convenient morning routine, add our Quatrefoil Peach Dorm Organizer. Our Quatrefoil Peach Dorm Organizer has a cute design that will add to your dorm room decor while sitting out on your dorm dresser or college desk. With a peach and white design, your cosmetics will look cute while being perfectly stored and organized in this dorm organizer. Our Quatrefoil Peach Dorm Organizer has 16 pockets around the outer edges to keep your eyeliners, brushes, and lipsticks separated. In the center is a large open top square that is ideal for larger cosmetic items such as foundation, powder, and large eyeshadow palettes. Plus, with all of your cosmetics in one place that keeps each item visible and organized, you'll save time in your morning routine from searching for an eyeliner.